ST. PETERSBURG, Florida -- Chris Archer pitched seven solid innings and the Tampa Bay Rays won the first game of the new Major League Baseball season, roughing up Masahiro Tanaka and beating the New York Yankees 7-3 Sunday. Evan Longoria and Logan Morrison homered and drove in three runs apiece before a sellout crowd of 31,042 at Tropicana Field on opening day. Tanaka, who had baseball's ERA in spring training, was tagged for a career-worst seven earned runs in 2 2/3 innings. A first-time All-Star in 2015 who lost an AL-leading 19 times last season, Archer limited New York to two runs and seven hits. He narrowly escaped a bases-loaded jam and turned a five-run lead over to a revamped bullpen. Closer Alex Colome replaced rookie Austin Pruitt with the bases loaded in the ninth, yielding a sacrifice fly to pinch hitter Chris Carter before finishing for a save. Leadoff man Corey Dickerson singled in the Tampa Bay first for the first hit of the season and later scored on Longoria's sacrifice fly as part of a three-run inning. Longoria connected for a two-run drive in the second. Down 7-2 in the seventh, New York had a chance to get back in the game in the seventh when Gary Sanchez's looper down the right field line barely landed foul with the bases loaded. Two pitches later, Sanchez grounded out to end the inning. Sanchez, a rookie power-hitting star last year, went 0 for 5. He struck out with two on in the ninth. Tanaka made his third consecutive opening day start for the Yankees, and had been 6-0 with a 2.82 ERA in eight career starts against Tampa Bay. He gave up eight hits and two walks. Tanaka tied Hideo Nomo for the most opening day starts by a Japanese-born pitcher. Longoria connected for his fourth homer on opening day. Morrison, who didn't drive in a run until May 17 last season, added a solo drive in the third. 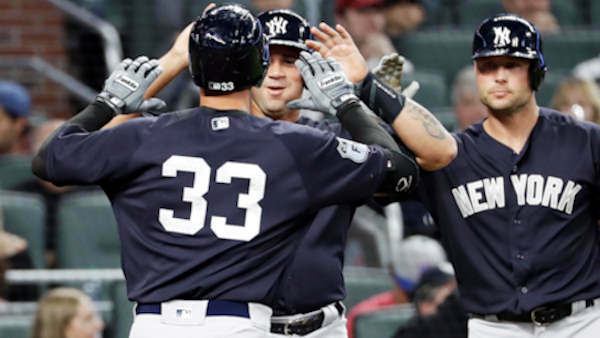 With a batting order featuring Sanchez, Judge, Greg Bird and Ronald Torreyes, who are all 24 years old, the Yankees began a season with an opening day lineup including four players under 25 for the first time since 1932. Yankees: SS Didi Gregorius (right shoulder strain) expects to start limited baseball activities the middle of this week. He is out until some time in May. ... INF-OF Tyler Austin (broken left ankle) was placed on the 60-day disabled list. Rays: Longoria, who sat out Tampa Bay's final spring training game due to a stiff neck, made his club-record ninth consecutive start on opening day. ... Seven players, including C Wilson Ramos, OF Colby Rasmus and SS Matt Duffy, begin the season on the disabled list. Yankees: LHP CC Sabathia, 3-7 in 14 starts at Tropicana Field since joining New York in 2009, is Tuesday night's scheduled starter. He's 2-0 against the Rays in three road starts over the last two seasons.